On SALE for the month of September are Vivid Promotions' Custom Printed Wax Highlighter Pens! These fantastic Coloured Highlighter Markers are new to our range and are already making a huge impact. Presented at introductory prices, these low cost Promotional Wax Highlighter Pens are sure to leave a lasting impression and brighten up your next promotion. Wax Lipstick Highlighter: Check out these colourful Wax Highlighter Pens with printing! Available in 3 bright colours, these 3 fluro Marker Pens are made with a special wax that is formulated so they will not dry out or smudge! Designed with a twist action end that winds the highlighter up, the Lipstick Wax Highlighter is an ideal product for conferences, to keep in the office or at home. 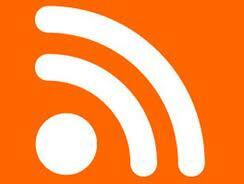 On SALE until the end of September - get in quick for special pricing! Wax Gel Highlighter Markers: Vivid Promotions' NEW Wax Highlighter Marker Pens are a great addition to our range! Presented at super cheap prices during September, these Branded Wax Highlighter Pens are available in 5 great fluro colours to enhance your logo! 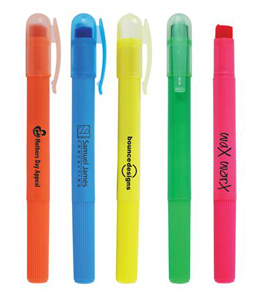 Solid Colour Highlight Wax Pens have a superior shelf life and will promote your brand over and over. Perfect giveaway, trade show or office promotional item that is sure to leave a mark! Vivid Promotions' is proud to present our new Wax Highlighter Pens at great prices all year round. As a special introductory offer, these fantastic Wax Highlighter Pens are on sale until the 28th September 2012. Print your corporate logo or message on the pen barrel and hand out at trade shows, brand launches, corporate meetings! 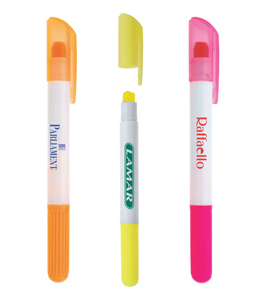 Offering great brand exposure, these low cost Marker Pens come in great flruo colours that are sure to stand out. Also included in our colourful Highlighter Pen range are the Brite Liner Grip Highlighters, Printed Mini Scented Highlighters, Branded Jug O' Highlighters, Decorated Carabiner Highlighter Pens, Fluro Evo Highlighters and Novelty Syringe Shaped Highlighter Pens. Perfect for medical institutes, schools, universities, corporate companies and anyone wanting to leave their mark; Vivid Promotions' collection of custom branded Highlighter Marker Pens are suited to just about any occasion. Contact us today on 1300 72 70 92 for a quote!